Whenever it comes to card games, Teen Patti has always drawn the attention of gaming enthusiasts. It is counted as the most popular and entertaining card game. However, in the past few years, Teen Patti has ventured into the digital space and is attracting the attention of million of card game lovers. Although, there are lots of online card games out there, but Teen Patti is specifically loved and enjoyed by the audience. So, if you are planning to have your own card game app, then this article is for you. Now to start with, let’s first understand what Teen Patti game is and why is it so popular among the people. Teen Patti is basically a poker game. It is a gambling of cards usually played in casinos and bars. It is played with uses of 52 cards and the Joker cards are not considered here. Each player is dealt with 3 cards. Prior to the cards are dealt, the boot amount is collected from each player. This amount is the minimum stake amount which is put in the pot on the game table. As the game progresses, the money in the pot grows and is given to the winner. People can easily download the app on their phones. Users can make in-app payments to avail extra features. Players can easily graduate from free to cash games. Players get rewards for different cash games and tournaments. Timely Updation: the app gets updated with the help of internet connectivity to allow users to enjoy new offers and exciting features, which makes it lot more interesting. User-friendly: the app comes with the attractive user-interface which is also user-friendly and thus, players can easily play the game without any hurdles. Multiplayer game: the game allows multiple users to play at the same time. Latest technology: the game works smoothly only when it is integrated with the latest technologies which makes it more effective. Multiple variations: the app allows users to choose from multiple game variations as per their mood and strength. Play with computer bot: when real players are not available, the app allows users to play with the computer bot till that time. Play Now: in this category of the game, there can be a limited number of people with limited ‘chaals’. Private Table: here the game is played with selected players who enters the game using a code. Tournaments: here the users who participate in the game can win by using extra chips or chances. 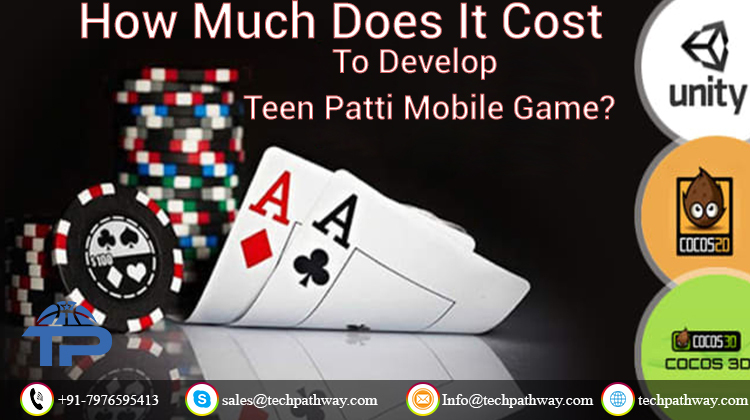 How much does it cost to develop an app like Teen Patti? The development cost of an app like Teen Patti depends on various factors such as complexity, app size, app development platform, etc. This way the app may cost you somewhere near $10000 to $15000 with the above said features.